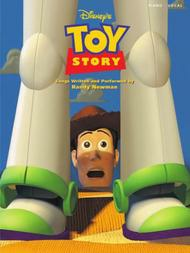 Toy Story composed by Randy Newman. For Guitar, Piano/Keyboard, Vocal. Piano/Vocal/Guitar Songbook. Disney, Movies and Pop Rock. Difficulty: easy-medium. Songbook. Vocal melody, piano accompaniment, lyrics, chord names, guitar chord diagrams and color photos. 32 pages. Published by Hal Leonard (HL.313033).ISBN 0793557445. With vocal melody, piano accompaniment, lyrics, chord names, guitar chord diagrams and color photos. Disney, Movies and Pop Rock. 9x12 inches.Vocal selections from the Disney movie featuring songs by Randy Newman. Songs include I Will Go Sailing No More, Strange Things, and You've Got a Friend in Me. Filled with full-color art from the film.